AFL is so popular in Melbourne that it needs two homes. The MCG is the traditional epicentre of all things football, but these days Harbour Kitchen’s neighbour in Docklands, Etihad Stadium, comes a close second. Having a world class sports stadium just a stone’s throw away from our function venue has many obvious benefits. It adds an extra dimension to life in Docklands, creating a fun atmosphere and helping the suburb shine even brighter. Many people decide to throw a pre or post game party, extending the good times through the afternoon or into the evening. Harbour Kitchen function venue couldn’t be better placed to make the most of a day or night out. Just a few minutes walk from Etihad’s Western entrance, we add a touch of class to any event. Our location is unrivalled in the city, we have food and drink to match and we are are affordably priced. Just like Etihad has done for sports in Melbourne, we’ve built a reputation as one of Melbourne’s premier function venue. The best thing about AFL is that it’s a weekly event for several months, with a guaranteed crowd and plenty of entertainment. It’s also the perfect excuse to get your friends and family together for celebration. 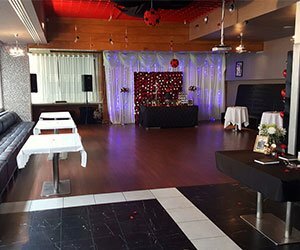 If you’re thinking of holding a pre or post football function this AFL season, the good news is you don’t have to look far from the stadium for an ideal function venue.